High-end Fashion store: Komakino 4.0 _ Mathias Vestergaard Corp. 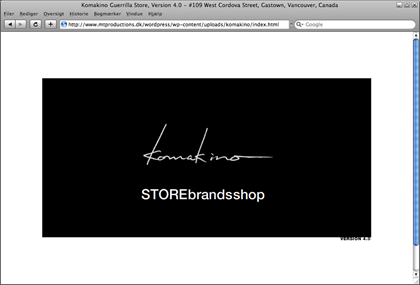 The Komakino Guerrilla Store is an amazing men’s store in Vancouver, BC. It moves to a new location every year, following the constant fashion flux. With every move, there appears a new website and for me it was an honour to design this year’s. First, I developed the version 2.0 website, with panoramic images of the physical store. When I was asked, to develop version 4.0, I wanted something more simplistic. At the time, I was completely obsessed with functional typography, especially the Helvetica font. Therefore, I decided to develop the site based on simple geometric shapes, the Helvetica font and the usage of black and white colours. When you first see the website it is so minimalist that it is almost boring, but if you keep starring at it, you will notice that it is not as it seems. In your peripheral vision the borders are moving (very slowly). Sometimes the box expands, and sometimes it contracts. Combined with another subtle shaky -effect (which corresponds to certain elements of the eerie background music) the website can almost feel uncomfortable. The store is currently in 7.0, but you can still visit the archived version 4.0 here. You can also read about the earlier version 2.0 here.